I finished Michael J. 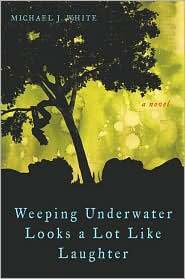 White's debut novel Weeping Underwater Looks a Lot Like Laughter pretty quickly. On top of that, I finished it over a month ago. I didn't review it sooner because I couldn't quite figure out how to write about it. (It didn't hurt that I was busy with school and the behemoth novel The Invisible Bridge). But I think I know how to do it now. Weeping is a coming of age tale, narrated by the protagonist, redheaded George Flynn. George's family has just moved from Davenport, Iowa, to Des Moines, Iowa. The book opens like this: “On our debut night in Des Moines, Nicholas Parsons murdered a high school senior in the hotel room directly beneath us.” And with that, George is thrown head first into his new world. The early part of the book is typical fish-out-of-water stuff, as George struggles to fit in with his new classmates. He joins the wrestling team and courts a girl named Emily Schell. Emily's issues range from her disgruntled, country-club parents to her younger sister Katie, a precocious middle-schooler with multiple sclerosis. And White's language through the novel's first half is tongue-in-cheek, he writes in a prose that almost refuses to take itself seriously. I saw/heard White read from Weeping at Micawber's Books, and White attended my Alma Mater. So I bought the book out of allegiance. It was a hardcover and I slipped off the dust jacket without even reading the inner flaps (I figured that I'd heard some excerpts and I had a sense of the book's premise). So I started reading the book and quickly felt lost. Not that I didn't understand it, but it read like a YA novel, and I wasn't really looking for a YA novel. The prose that didn't take itself seriously also didn't allow me to take the book seriously. And, to be honest, if I hadn't had the connection to the book, I might not have kept reading. But I kept reading and I'm glad I did. At around page 138 the book changed. The subject matter stopped being superficial and became real. George Flynn's high school dramas suddenly took a backseat to George Flynn's life dramas. The prose took on a weight and seriousness that made me care and pay attention. White's language still snapped, but it snapped with emotion instead of insouciance. The guise of a YA novel fell away. Instead of subjects like fitting in and perseverance, the focus shifted to loss, grief, love, betrayal, and reconciliation. Finishing the novel, I realized why (at least, this is how I justified it) White chose to tell the story this way: George doesn't want to tell this story, not at first. And so he takes his time getting to the heart of the tale, meandering with unimportant quips and funny anecdotes. The story still carries such an emotional onus that he has to work up the courage to tell it. It's how I tell important stories: I frontload with extraneous details until I'm ready to tell the real story. I'm glad I stuck with Weeping. The novel is both tender and sincere. White's writing broke my heart several times in the latter half of the book, and he earned each one. Of course, had I read the dust jacket, I would have known what to expect? but it's those little surprises that make reading so much fun. I live in Saint Paul, MN. I am 26 going on 27. I am fluent in Ukrainian, but I'm of Irish/Norwegian/Dutch descent. I am not allergic to anything, although there are plenty of things that I have yet to encounter in my life. I'm a fan of Chabon, Pynchon, and McCarthy (among so many others). I'm a Grad student, but I filed my taxes under the occupation of Adventurer.